If there's one colour I'm obsessed with at the moment it's blue. I am seriously loving all things denim, all things blue and I think that blue will be a massive colour trend for spring/summer 2015. Every week I find the best picks on the high-street which i'm currently obsessing over. If you haven't caught up with last week's high-street post you can catch up here. At the moment Boohoo are absolutely killing it when it comes to summer clothes. I love the floral crop top and I think it'd look amazing with high-waisted jeans or a pair of denim shorts. I've noticed on the high-street at the moment it's all about denim dungarees and denim pinafore dresses are everywhere. This one from Topshop is gorgeous. It'd look amazing with a turtleneck crop top or a striped tee. 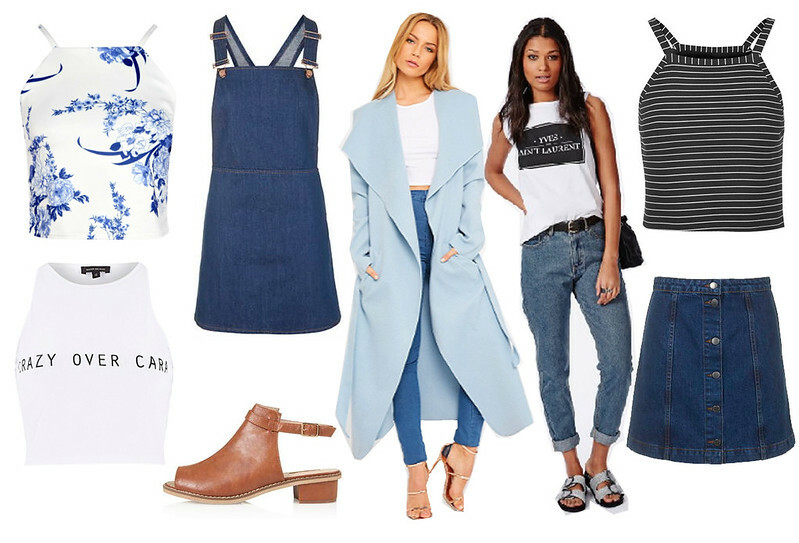 What do you think of this weeks high-street picks? What's your favourite item on this wishlist? the blue and white top is just so cute !